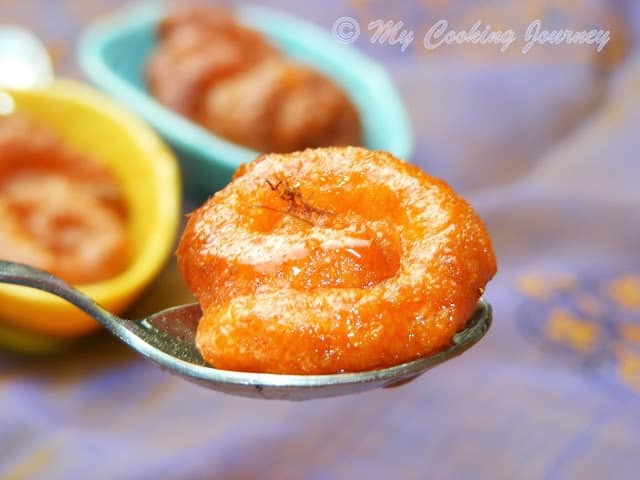 When I was looking for a Bengali sweet recipe to make for my Blogging marathon, this recipe caught my eye and that is when it hit me that I could make the Bengali Chanar Jalebi that was given to us by Chandrani of Cuisine delights. 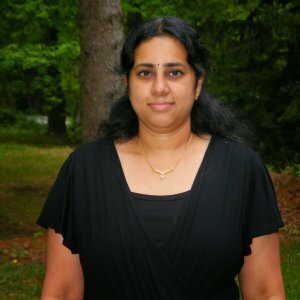 SNC was started by Divya Pramil of You Too Can Cook in which the Southern region and the Northern region compete against each other and in the process learn to make an authentic dish. 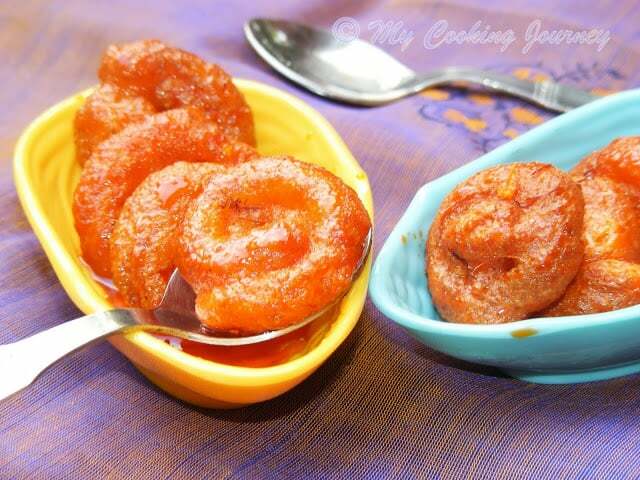 Chanar Jalebi or Paneer Jalebi is a famous Bengali sweet made during any occasion. 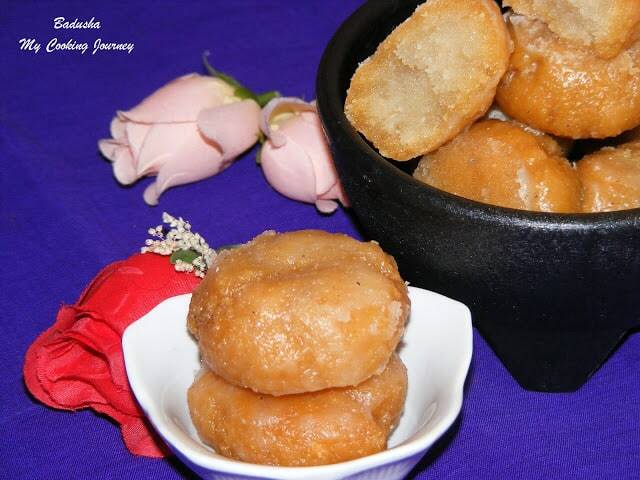 This jalebi is made out of paneer or Chanar and then soaked in warm sugar syrup. 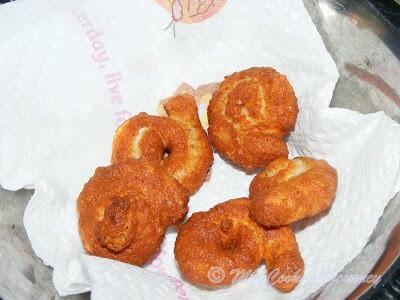 The recipe is very easy to follow, but I had some trouble shaping the jalebi’s. I did realize that this was caused because I did not strain the Paneer enough and hence there was abundance of moisture in the paneer which caused the dough to be very sticky. I did overcome this issue and I will explain in detail how I did so. 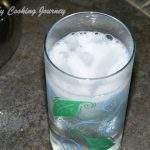 Make the Paneer from the milk. 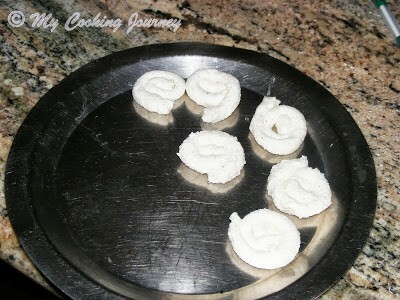 Please refer to my detailed post here to see how to make homemade paneer. Once the paneer is drained enough that there is no excess liquid and yet it is slightly wet to touch, add the maida, baking powder and cardamom powder to it and knead well for about 10 to 15 mins to get smooth, soft dough. Meanwhile to make the sugar syrup, heat the sugar and water in a heavy bottom pan in medium heat. 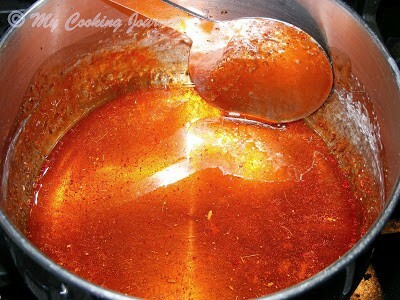 Once the sugar is dissolved and it boils, simmer the syrup until it reaches a sticky consistency. Now add the food coloring (optional) and the cardamom powder and then turn off the flame. 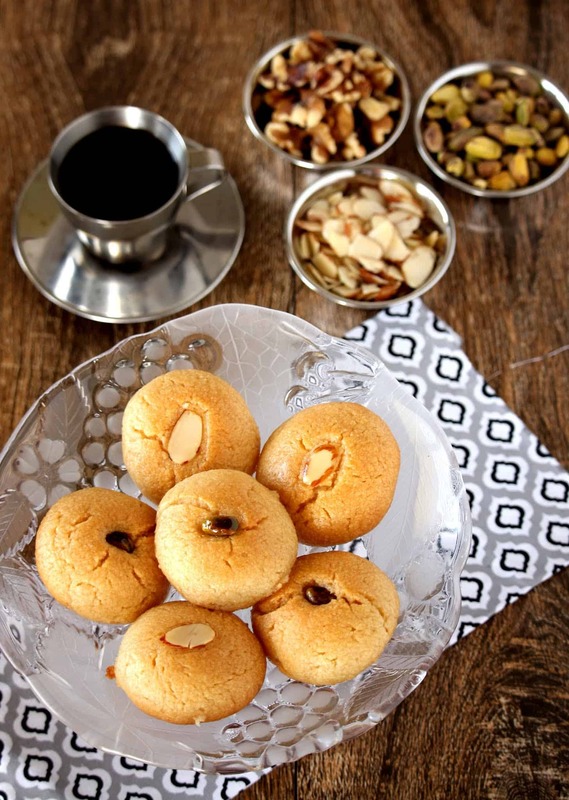 Keep the syrup covered until the jalebis are ready. 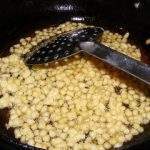 Divide the dough into 15 small balls and then roll it into thin long cylinder. 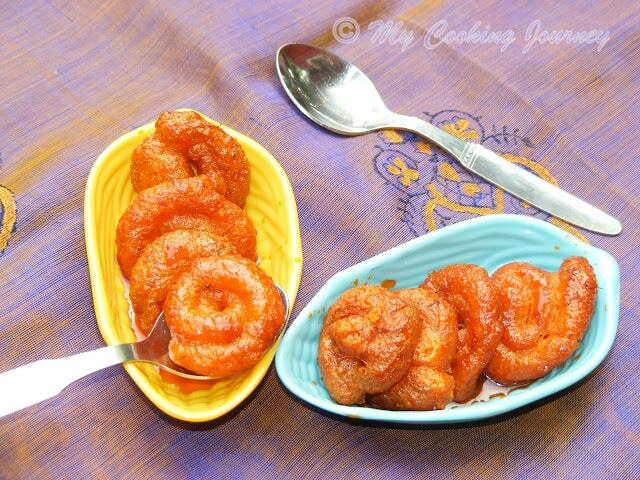 Now shape the cylinder in the form of jalebi (spirals) and arrange them on a plate. 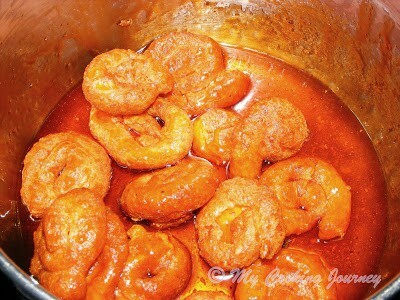 Heat oil in a deep kadai and fry the jalebis in low heat to golden brown color. Drain it on paper towel. Immediately soak the jalebis in the warm sugar syrup. Repeat the same for the rest of the dough. Cover the sugar syrup and let the jalebis stand in it for couple of hours. 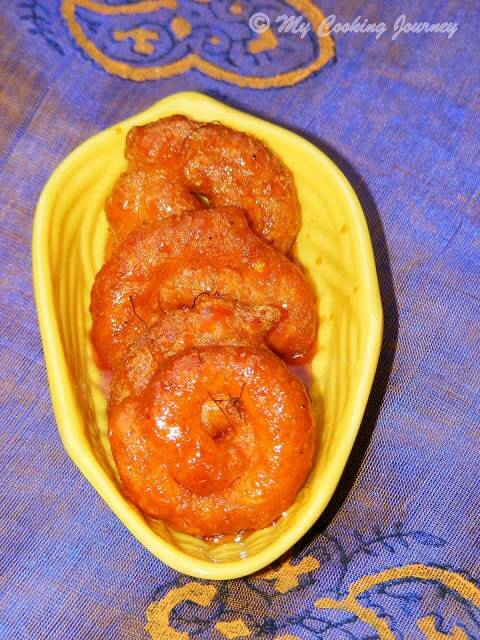 The jalebi would absorb almost all the syrup and it is now ready to be served. Serve it in room temperature or cold. 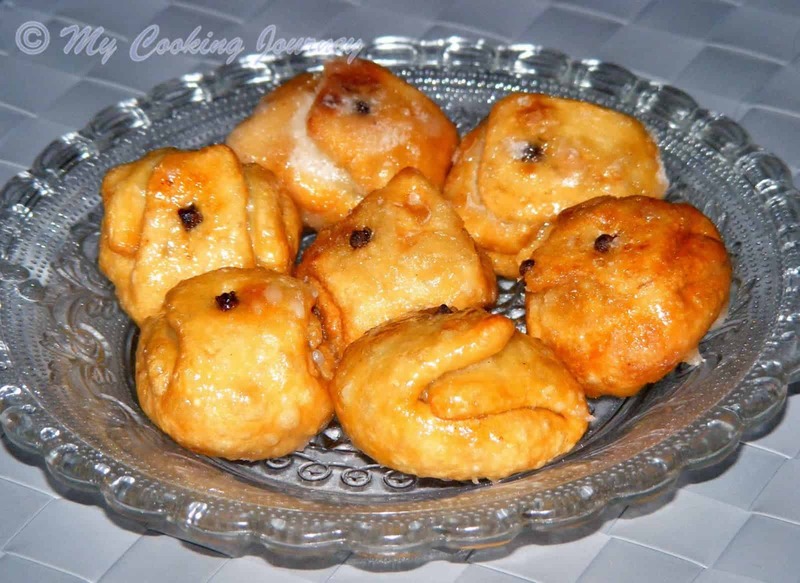 My dough was very sticky and I could not make any balls or roll it into cylinder. This was because I did not drain the paneer enough. 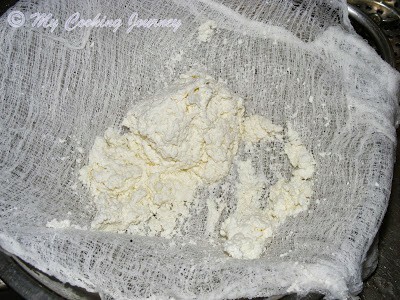 So make sure that the paneer is almost dry before making. Also if your dough appears too dry and cracked, add the couple of tsps of milk mentioned in the ingredients list to make it soft. 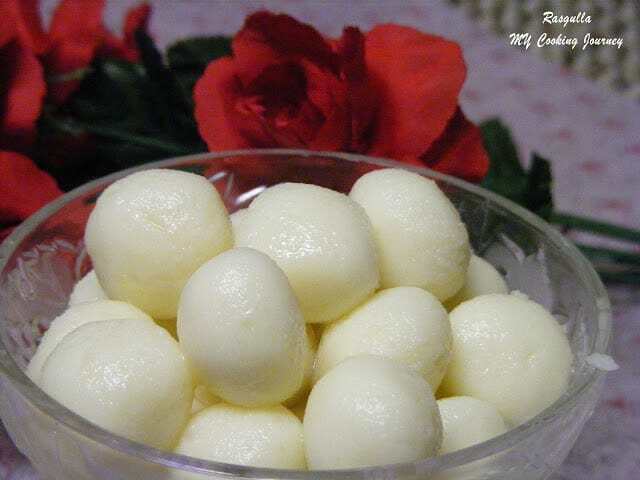 I stuck my very wet dough in the refrigerator for couple of hours and then worked with cold dough. 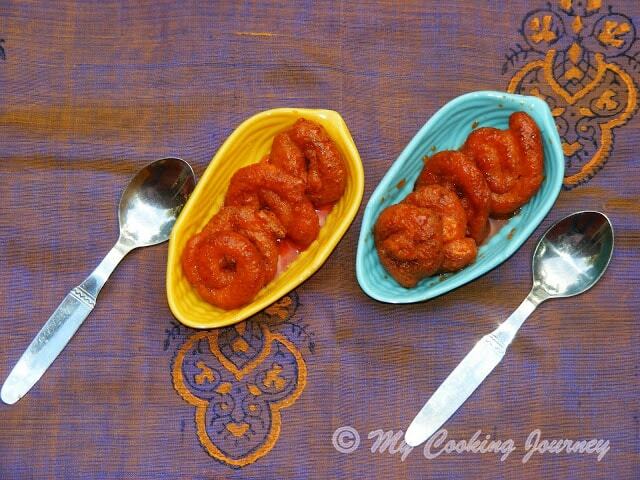 This way I was able to get the shape and make the jalebis. 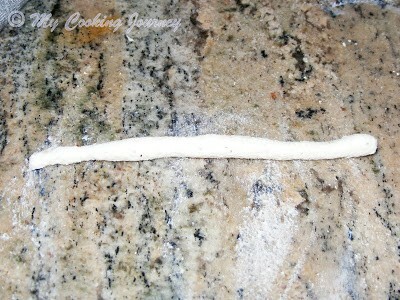 So if any of you encounter the same issue, work with cold dough. The cold stiffens the dough a bit and makes it easier to work with. 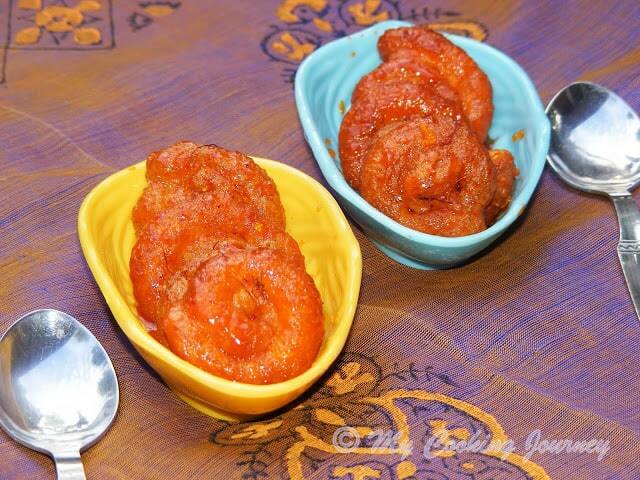 Jalebi looks delicious and perfect. Delicious jalebi . Looks perfect for any occasion. Looks great and Thanks for the detailed explanation. 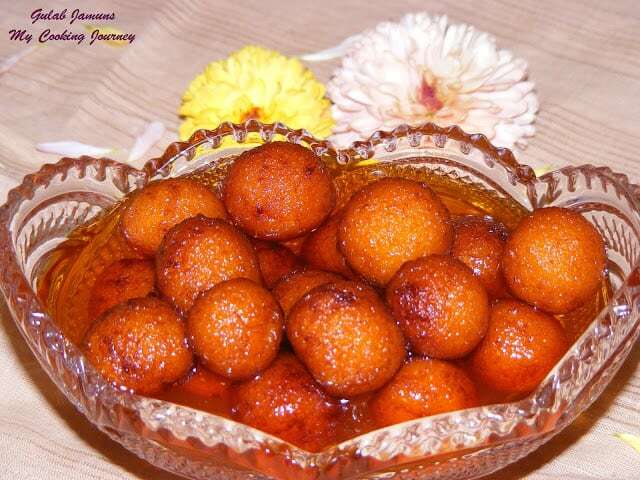 Such an elaborate process.. the process seems similar to gulab jamuns.. Lovely paneer jalebis! 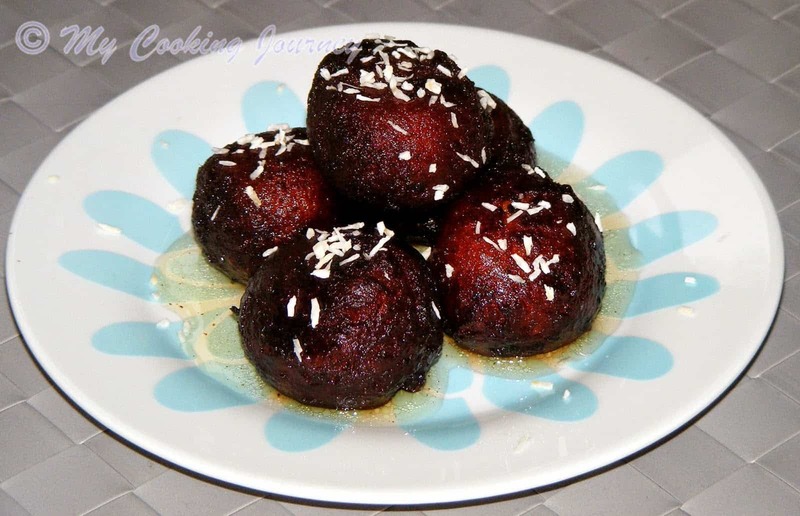 wow..simply wow..loving the recipe..and will try it as soon as I have some dinner.. The jalebis have come out beautiful, juicy and yummy. Love it! This is such a fab challenge, mouthwatering. And you have turned out perfect jilebis. wow, this recipe is new to me. Thanks for sharing. looks delicious. Beautifully done, juicy jalebis looks extremely attractive. Crispy and juicy; Love them. such a beauty …. I just cant wait to have them . Those paneer jalebis look sooooooo good. Love the presentation and the clicks are too tempting. 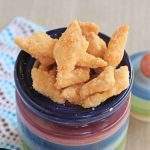 I wouldn't have thought that anything that looks so good would be relatively easy to make. Bookmarking this recipe to try out later. 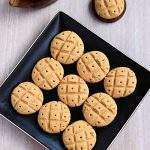 I have been trying to get myself to make these but you have now tempted beyond what I am capable of handling!! Awesome! Am just loving it seeing the yummy Jalebi. that looks unbelievably beautiful… love the photo in the spoon (closeup) – super professionally done… should try this one soon!! !